The mysterious quantum world and why Einstein was probably wrong. 4 Why is the quantum world mysterious ? 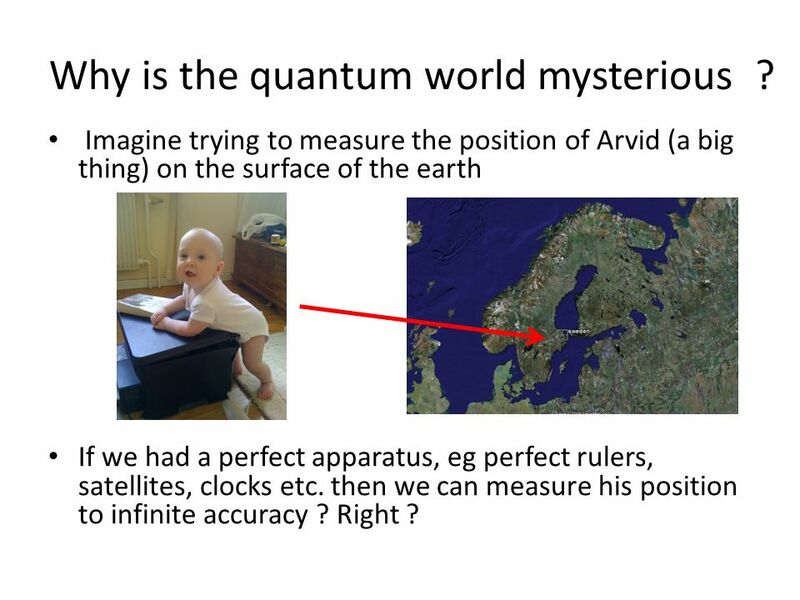 Imagine trying to measure the position of Arvid (a big thing) on the surface of the earth If we had a perfect apparatus, eg perfect rulers, satellites, clocks etc. then we can measure his position to infinite accuracy ? Right ? 7 More implications Its not just position and speed. 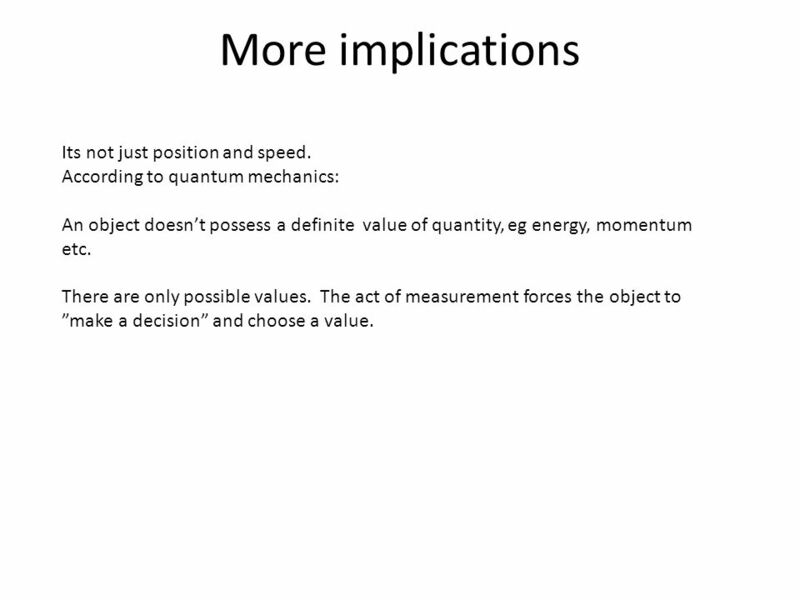 According to quantum mechanics: An object doesn’t possess a definite value of quantity, eg energy, momentum etc. There are only possible values. The act of measurement forces the object to ”make a decision” and choose a value. 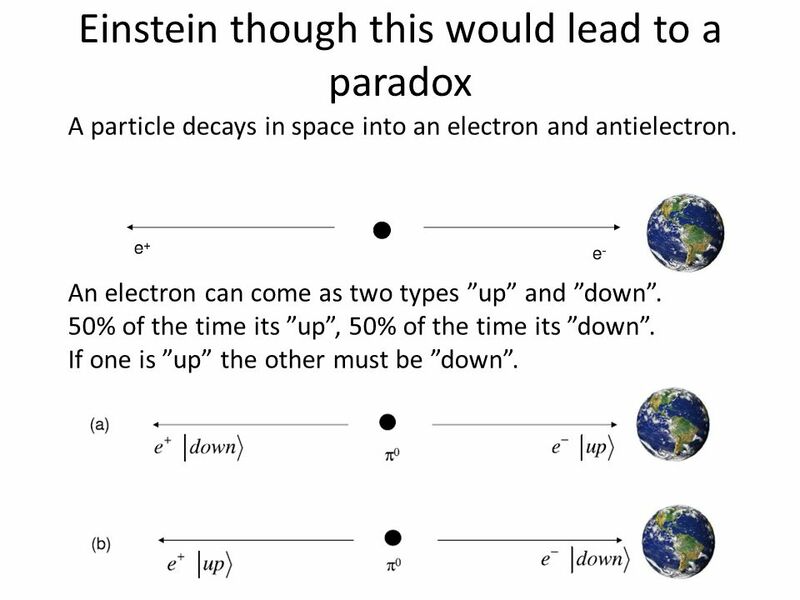 9 Einstein though this would lead to a paradox A particle decays in space into an electron and antielectron. An electron can come as two types ”up” and ”down”. 50% of the time its ”up”, 50% of the time its ”down”. If one is ”up” the other must be ”down”. 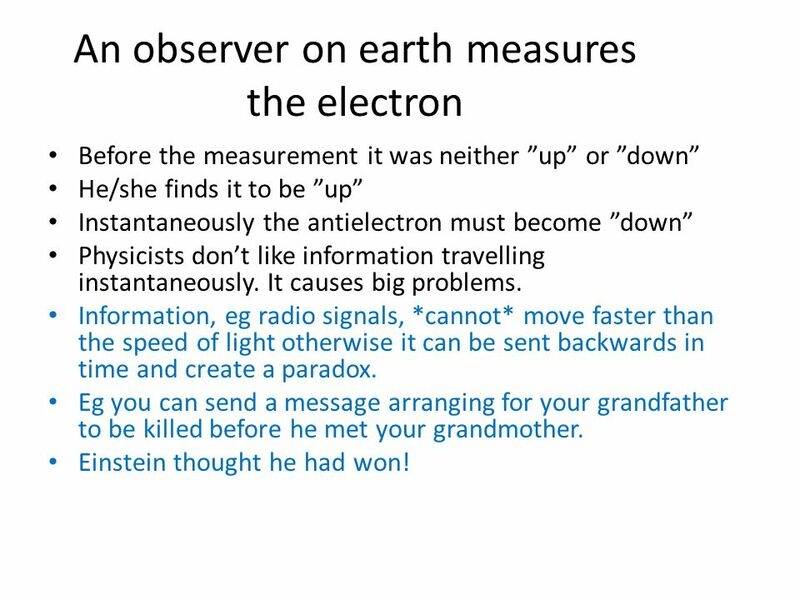 10 An observer on earth measures the electron Before the measurement it was neither ”up” or ”down” He/she finds it to be ”up” Instantaneously the antielectron must become ”down” Physicists don’t like information travelling instantaneously. It causes big problems. Information, eg radio signals, *cannot* move faster than the speed of light otherwise it can be sent backwards in time and create a paradox. Eg you can send a message arranging for your grandfather to be killed before he met your grandmother. Einstein thought he had won! 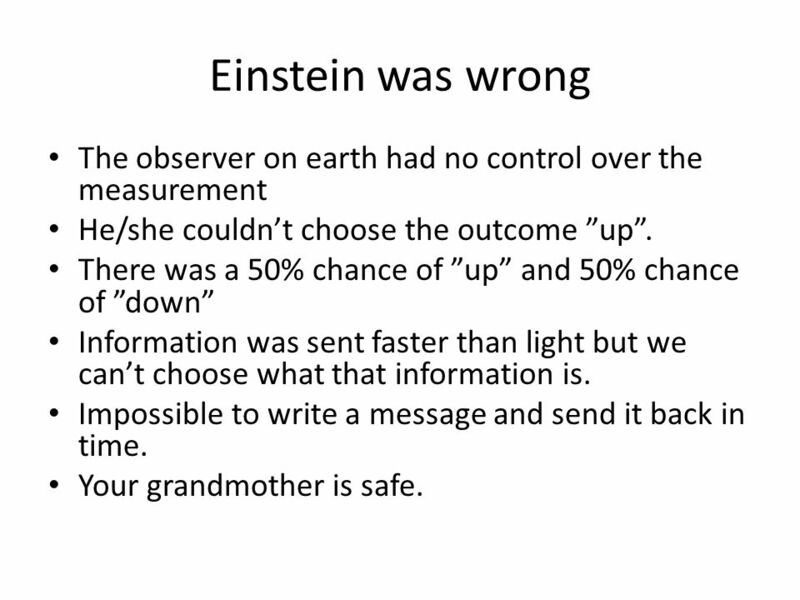 11 Einstein was wrong The observer on earth had no control over the measurement He/she couldn’t choose the outcome ”up”. There was a 50% chance of ”up” and 50% chance of ”down” Information was sent faster than light but we can’t choose what that information is. Impossible to write a message and send it back in time. Your grandmother is safe. 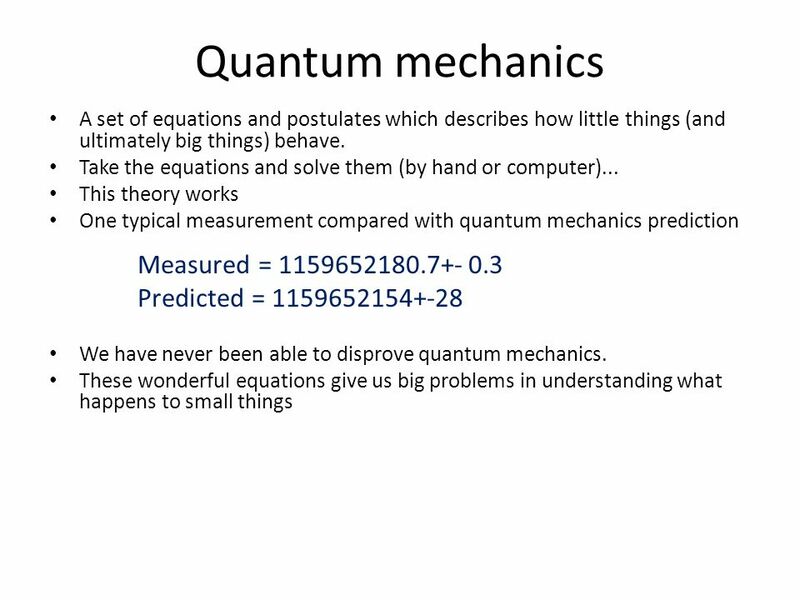 12 Summary Quantum mechanics is the best tested theory in history Its also strange An object doesn’t have a position until a measurement is made – its everywhere and nowhere. The measurement forces it to ”choose a location”. We never see this effect because the number h is tiny If h was big we would see it in our everyday lives Einstein hated all of this – he thought ”God doesn’t play dice” So far, all the measurements indicate that Einstein was wrong. 13 But is it useful ? 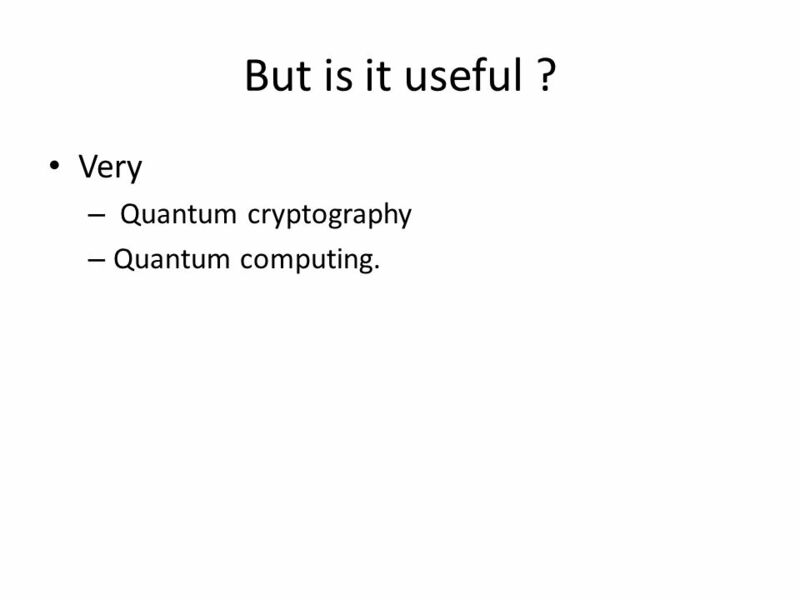 Very – Quantum cryptography – Quantum computing. 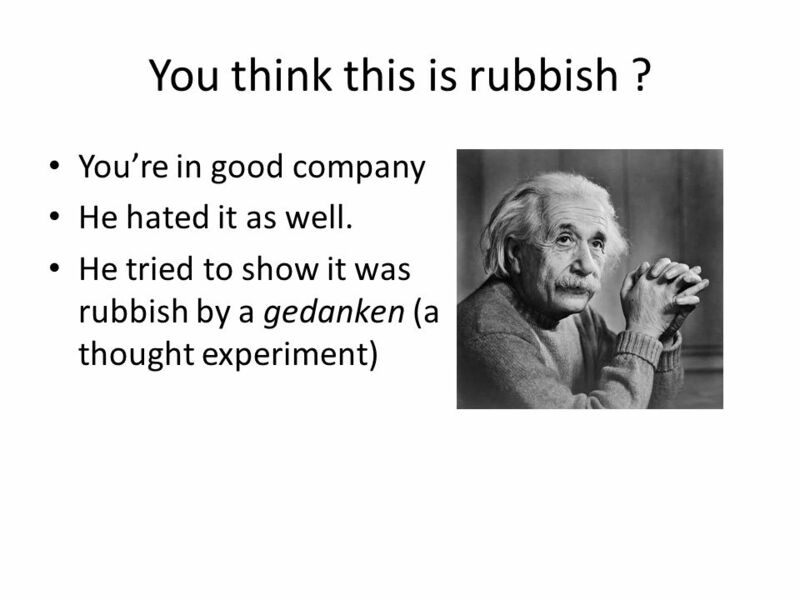 Download ppt "The mysterious quantum world and why Einstein was probably wrong." 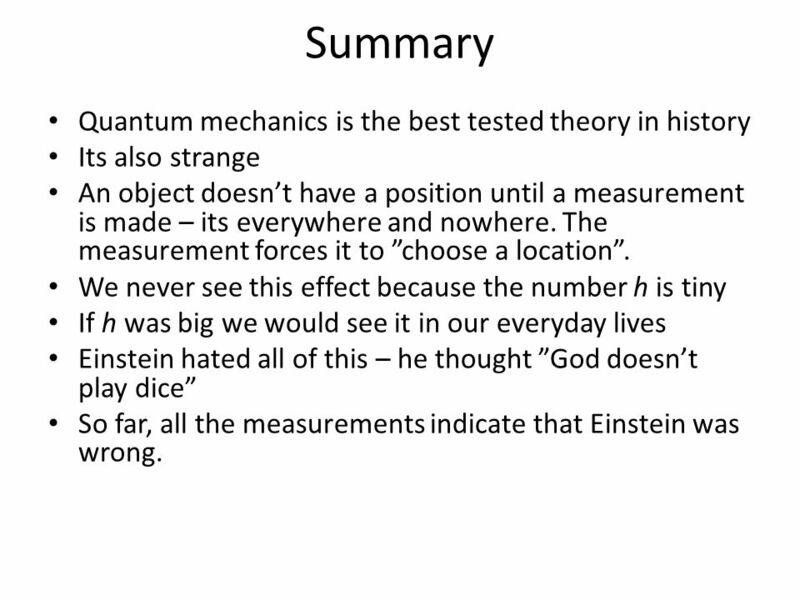 Modern Physics I Wrap Up. I.Einstein’s early years II.The Miracle year: 2005 A.The Quantum Nature of Light B.Brownian motion and atomic theory C.Special Relativity 1.Newton and. 1Recap. 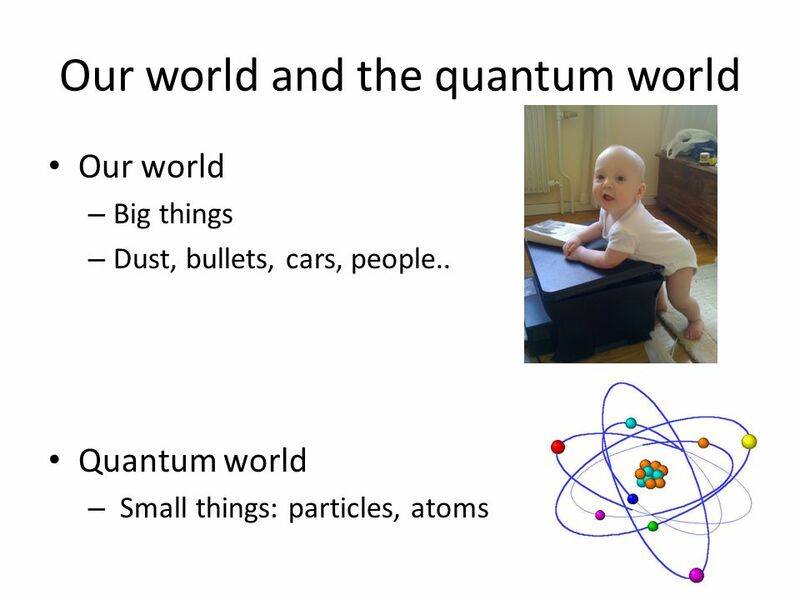 2 Quantum description of a particle in an infinite well  Imagine that we put particle (e.g. an electron) into an “infinite well” with width L.
The Big Bang A Timeline. What do you think you know about the Big Bang? Take a couple of minutes to write down what you know, or think you know about. String Theory The Theory of Everything Ryan Tiraschi. 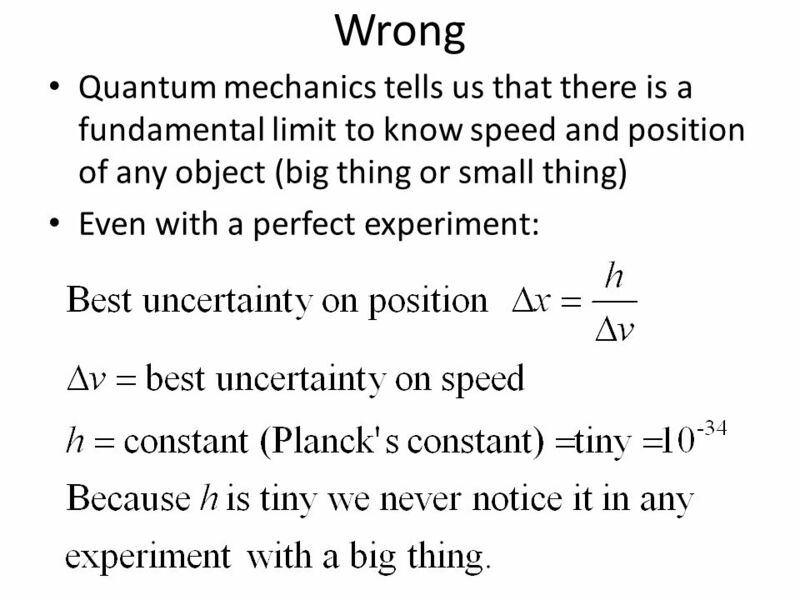 Quantum Mechanics. 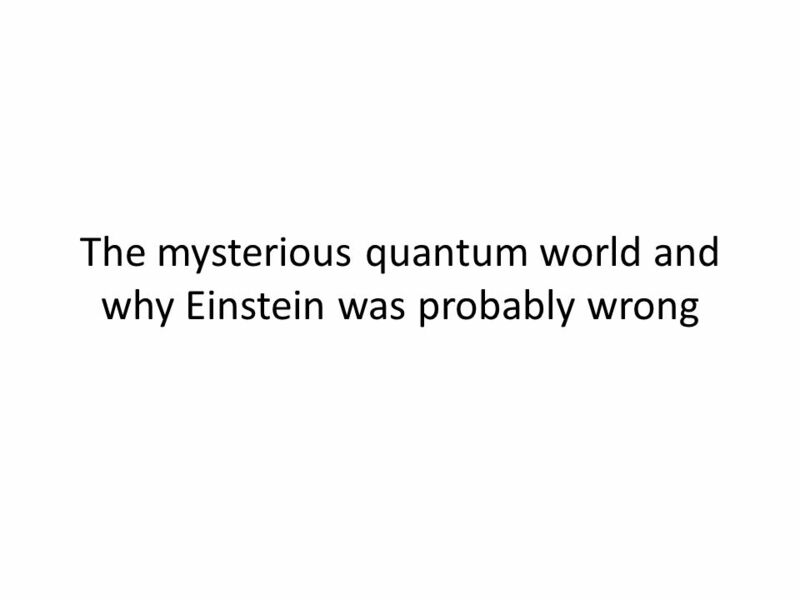 What is Quantum Physics? Quantum physics takes into account every possible outcome of measurement of physical properties  Quantum. 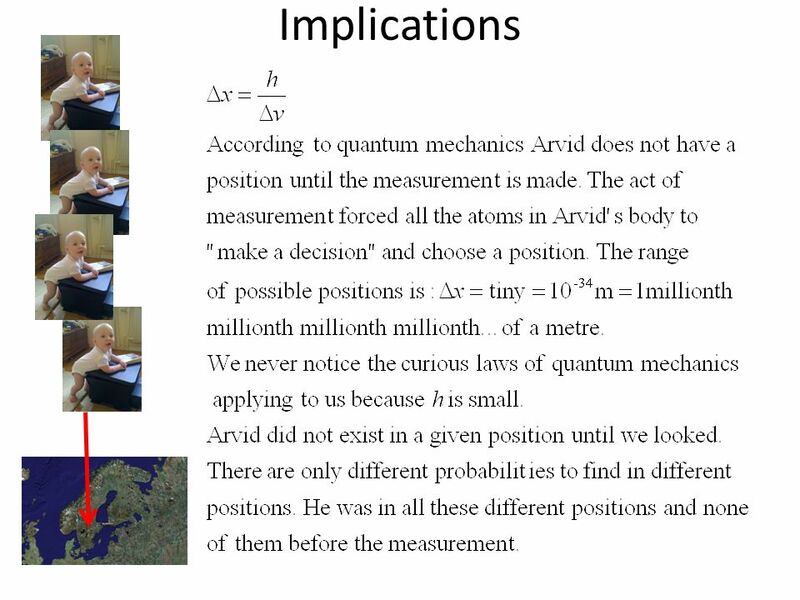 Quantum Mechanics Weeks One & Two HTH Senior Physics Andrew Gloag. Dark Matter Masses of Galaxies Gravity and Light Black Holes What is Dark Matter? Quantum Information, Communication and Computing Jan Kříž Department of physics, University of Hradec Králové Doppler Institute for mathematical physics. Chapter 7: Electronic Structure Electrons in an atom determine virtually all of the behavior of the atom. Quantum theory – the study of how energy and. Chapter 26 Relativity. General Physics Relativity II Sections 5–7. Einstein’s theory of special relativity makes some very bizarre and counter-intuitive predictions. Anything that violates common sense like this must.